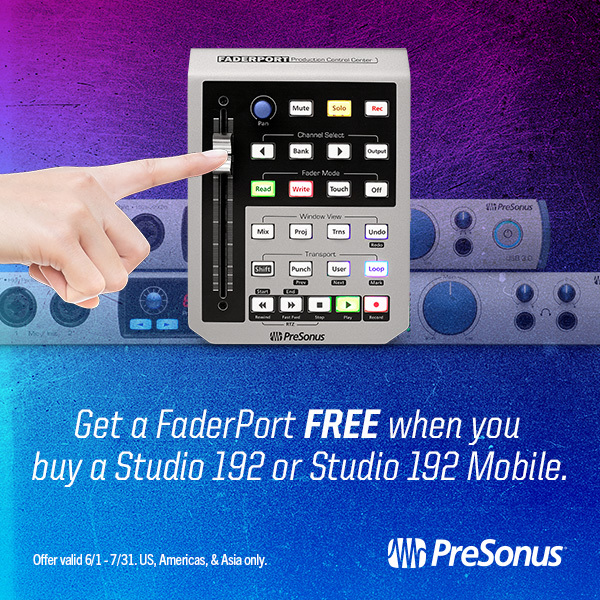 FREE FaderPort When You Buy a Studio 192 or Mobile! For the next two months customers in North and South America and Asia will score a FREE FaderPort when they purchase a Studio 192 or a Studio 192 Mobile! Also included, the Studio Magic Bundle! That’s seven popular plug-ins in VST, AU and AAX formats all free! All you need to do is register your device and the plug-ins will show up in your my.PreSonus account. Interested? Find a dealer in your area and take home a Studio 192 or the Studio 192 Mobile AND a FaderPort. You won’t be disappointed. This offer is valid 6/1-7/31 2017. Posted in Promo / Discount | Comments Off on FREE FaderPort When You Buy a Studio 192 or Mobile!